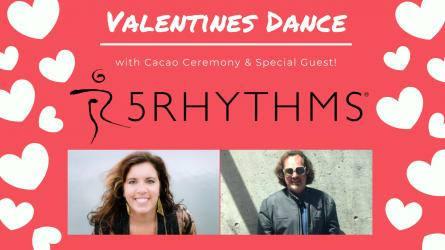 with Cacao Ceremony & Special Guest! Deep Dive Oakland is excited to welcome you to a very special Valentines Dance on Valentines Day!! 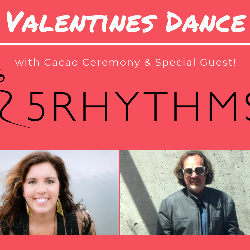 Our evening will start off with a 45 minute warm up wave led by Sayrah Garrison followed by a heart opening Cacao ceremony that will begin promptly at 8:15p.m. Special Guest teacher Benson Scott will offer luscious sound landscapes as we continue to open our hearts in community and dance. Our evening will conclude with a smorgasbord of Strawberries & Chocolate to share in our closing circle. Benson Scott is the founder and co-conspiring teacher of Rise Dance Movement: A restorative justice practice that centers around leadership from within through music and movement. Rise welcomes all people to the dance floor wherever that floor may be. Our mission is to bring restorative practices to movement with a cooperative and collaborative leadership. Benson brings a playful heart and creative spirit to the music by DJ’ing to the ear of the group body. He follows the pace and movements of the group by doing live mixes interspersed with inspirational words while offering a wide field of movements and justice practices. Sayrah Garrison is a certified 5Rhythms® teacher and has been teaching a weekly 5Rhythms class in Oakland for over 4 years. She teaches yoga, meditation, and mindfulness to the general public and is committed to exploring how these body based practices affect positive change for all! Created by Gabrielle Roth, the 5Rhythms is a dynamic movement practice rooted in the principle that if you put the psyche in motion it will heal itself. Through the map of the 5Rhythms (www.5rhythms.com), we will take a deep dive into our own inner landscape to discover our authentic selves. The only requirement is that you have a curious mind and a desire to explore creativity, connection and community. Contribution for this special event is $35. If you are a class card holder you may use 2 classes for this event. Please plan to arrive on time at 7:30PM. Doors close at 8:15PM.